A comprehensive understanding of the population structure and genetic diversity of potential germplasm is necessary for making breeding decisions and to fully interpret marker-trait associations. 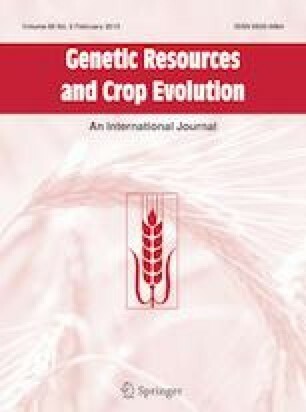 The purpose of this study was to examine the genetic diversity and population structure of a panel of 194 synthetic hexaploid-derived wheat (SHW; Triticum aestivum L.) accessions using 6904 polymorphic single nucleotide polymorphism (SNP) markers. Ancestry-based dissimilarity indices and marker-based genetic distances were positively correlated (r = 0.67). The variation in the primary synthetic parent in the pedigrees accounted for 4.52%, while the degree of the synthetic contribution accounted for only 1.06% of variation in the genetic distance. In addition, variation in the Aegilops tauschii Coss. (syn. Aegilops squarrosa auct. non L.) accession and T. turgidum accession used in the initial cross accounted for 3.48% and 2.75% of the variation in genetic distance, respectively. Using a model-based population structure approach, seven sub-populations were identified in the panel. Results of the model-based population structure analysis was for the most part in agreement with the distance-based clustering using unweighted pair group method with arithmetic mean (UPGMA) of the genetic distance or ancestry data and the principle component analysis of relatedness. We conclude that using a model-based approach provides a more statistically robust estimation of population structure. Results of this study, while highlighting the potential contribution of introgressed genome in the panel, provide the foundation for employing this panel in genome-wide association studies. The online version of this article ( https://doi.org/10.1007/s10722-018-0711-9) contains supplementary material, which is available to authorized users. Technical assistance of Yasmina Bekkaoui for performing SNP array hybridization, bioinformatics support of Dr. Matthew Hayden at La Trobe University in Melbourne, Australia in SNP genotype calling, and the financial support of the project by the National Scientific and Engineering Council of Canada are duly acknowledged. EG and AN design the experiment, TP provided the germplasm and pedigree data, MK and EG conducted the lab work, SK genotyped the population with SNP markers, EG analyzed the data and prepared the manuscript, EG, MK, SK, TP, and AN reviewed and edited the manuscript prior to submission.